Those red thermometers near the end of the week? Those might as well be matches. I’m as pale as pale gets and I’m pretty sure my internal radiator is broken. If I don’t come back, just know there’s a pile of ashes somewhere in Nevada that might slightly resemble me. We all know Las Vegas is full of lights and neon, but underneath all that glitz and glitter is a simple desert, which explains that insane weather. I think this little faux cactus from Meg Ruth would be a great centerpiece for a Las Vegas themed party. A bag is kind of a must when walking The Strip, if for no other reason than sunscreen and lip balm. These Neon Trimmed Purses from The Pretty Life Girls seem just about perfect for this trip. 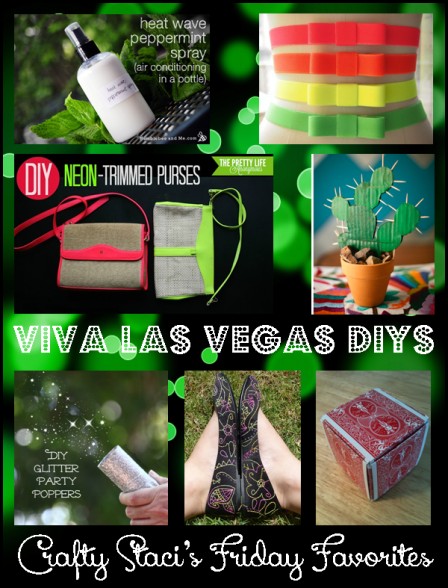 Want to bring a little Vegas with a twist into your space? Check out these Googly Eye Dice from 30 Minute Crafts. You can’t turn a corner in Las Vegas without spotting playing cards. They’re at the gaming tables and anyone who is trying to sell something has their version. If you find yourself with an abundance of maybe not quite complete sets, try out this gift box from Snapguide. Nothing is too bright in the city that never sleeps, so take the opportunity to wear this Neon Elastic Bow Belt from What I Do on your next trip. For a little pre-trip snack, or as part of a Vegas themed buffet, try this Dice Dip from Hungry Happenings. Bring a little Vegas luck home and try it on your own poker table, like this one from masterjeo on Instructables. Vegas = glitter. Or something like that. Say it with DIY Glitter Party Poppers from Danya Banya. These Neon Doodle Embroidery Super Kicks from Dream a Little Bigger look like they’d be right at home. I found it. This is how I’m going to cool off next week: Heat Wave Peppermint Spray from Humblebee and Me. That, or someone can use it to rehydrate my ashes.